Overkill 2: When this unit destroys a unit an opponent controls by attacking, deal 2 damage to that opponent's Phoenixborn. 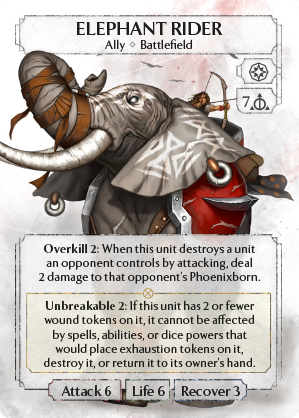 Unbreakable 2: If this unit has 2 or fewer wound tokens on it, it cannot be affected by spells, abilities, or dice powers that would place exhaustion tokens on it, destroy it, or return it to its owner's hand. Damage. Unblockable damage/wounds is arguably the best way to deal with an Elephant Rider (Shadow Counter, Molten Gold, Frostbite, [[natural:power]], Poison, Winged Lioness + Massive Growth, etc.). Exhaustion. The key thing here is you have to "move" the [[exhaust]] onto the Elephant (Transfer or Chaos Gravity are the only ways to do this when I posted this; note that for Chaos Gravity you must move the [[exhaust]] to the Elephant Rider, so it requires at least 1 other unit on your opponent's Battlefield). Deep Freeze can also work as a poor man's [[exhaust]], though you're only delaying the inevitable in this case. Illusion units. Units with the Illusion ability do not trigger Overkill because they are destroyed by Illusion rather than by the Elephant's attack (False Demon, Shadow Hound, Shadow Spirit). This makes them excellent chump blockers, and since they are often undercosted for their stats trading a bunch of them to lock down an Elephant is usually a resource win. Fade Away cannot even be attached (see Ashes FAQ, p. 3 "Q: Can I play alteration spells on my opponent's Seaside Raven? "); if it is attached while the Elephant is damaged but the Elephant's recovery value takes it under 3 wounds I am honestly not sure what would happen because there does not appear to be any applicable ruling in the rules or FAQ. My gut feeling is Fade Away would remain in play, but would not destroy the Elephant. Mark of the Goddess + Blood Chains isn't a valid play (unless the Elephant is wounded prior to Blood Chains resolving), because destroying the unit is an effect of Blood Chains, not a cost. Elephant Riders with 2 or fewer wounds are immune to Kneel and Meteor (both the [[exhaust]] and the damage, in Meteor's case). To Shadows cannot affect an Elephant with 2 or fewer wounds. You could validly argue that Illusion can be added to the Elephant Rider with To Shadows, but if it receives damage while at 2 or fewer wounds Illusion cannot trigger. However, there is precedent for "would" triggering for effects that only might occur, because Elephant Rider is explicitly immune to all of Meteor's effects per the FAQ (p. 10), and the exhaustion effect that triggers this immunity is optional (because you could pay 1 [[basic]] to avoid it). I think the version where you can use To Shadows to add Illusion but have it not do something when remaining health is too high is my preferred solution. Not because it is super consistent but because i don't like that it is so unclear what the word "would" implies to someone who does not have the FAQ at hand. Then it is one of the few cases in Ashes where you are explicitly asked to consider all possible outcomes of an interaction. This one is short and easy to memorize but if there comes more of that it will be a nightmare. An finally To Shadows is already a card that no one uses that is supposed to be hyper efficient against big Units - which is exactly what it fails to do here. Meteor only affects the Elephant Rider if the owning player does chose to pay to not play an exhaustion token, with the argument that then the spell would not place an exhaustion token. You almost never want to do that, but now evaluating "would" clauses is way easier. I guess the idea with Nightshade and Particle Shield is that the attack is in some sense too fast be prevented. Given the cost of the unit and its low stats that even seems to be fair from a balance perspective but i also dislike how the game distinguishes between things that would be synonymous in everyday language.